The breast is then lifted, creating a pocket into which the implant is inserted. Saline implants may also be placed endoscopically through an incision in the navel. This minimally invasive breast enhancement technique is known as a transumbilical breast augmentation or TUBA approach. 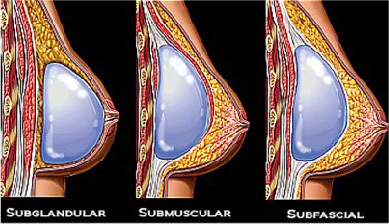 Implant placement beneath the muscle of the chest offers a few advantages over placement beneath the breast tissue only. These include reduced risk of capsular contracture (post-operative tightening around the implant) and less interference with mammogram examinations. Possible disadvantages include need for drainage tubes and elevated pain in the first few days following surgery.